Think you can’t do much with just one cross-pole? Think again! Show jumper Jessica Mendoza has two exercises for you to try, which will not only improve the way your horse goes, but also stops the boredom setting in. Horses can get used cantering towards and jump and become quite excited. To help remedy this, take things down a notch and ask your horse to trot on the approach. This will encourage him to relax and become softer in the hand. For this exercise set your cross-pole up half way down one of the long sides of your arena or field, just in from the track. 1 On the right rein, ask your horse to go large in trot around the area you’re working in. 2 Once you’ve established a steady rhythm, turn down the long side towards your fence, maintaining your balanced trot. 3 Jump the fence and bring your horse back to trot as soon as possible if he canters. 4 Ride back towards the track and change the rein to repeat this on the other side. 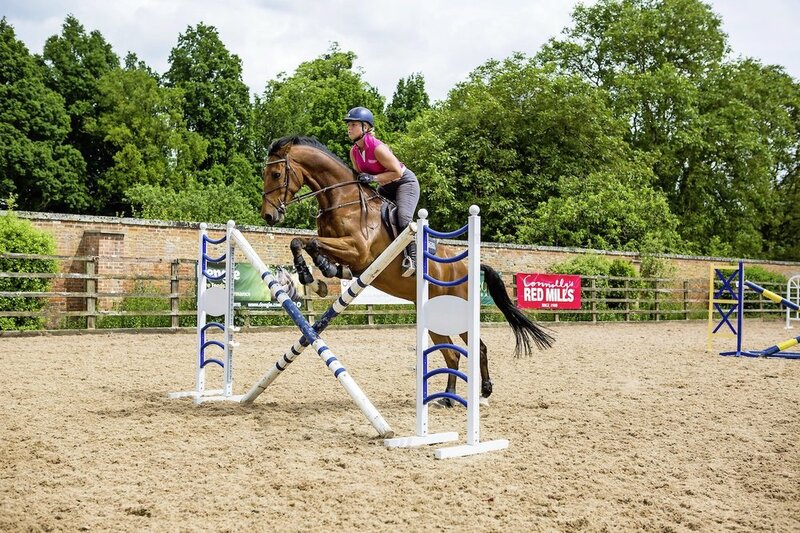 If your horse tends to flop himself over jumps with little finesse, this is the exercise for you. By lifting the poles to the highest point on your wings, you’ll encourage your horse to lift his shoulders, giving him a much better shape as he pops over. Put your cross-pole in the middle of your school. Raise the poles so they sit at the highest point. 1 Establish a bouncy canter around the outside of the school on the right rein. 2 Come off the track just after E (or the centre of you schooling area) onto a figure of eight. 3 Circle around so you’re heading straight to the jump. 4 Jump the cross-pole and continue on your figure of eight, circling round to the left. 5 Continue to circle to the left so you’re back facing the jump. 6 Jump the fence and finish your figure of eight to the right, back to the track. 7 Change the rein and repeat. Try it in trot first if you’re struggling in canter.